Rails has a well defined plug-in structure that enables you to easily install and use plug-ins in your application. David Heinemeier Hansson, the father of Rails, once stated that he uses five to six plug-ins in each Rails application. There’s an old nugget of developer wisdom that “the best code is no code at all.” Part of what makes us so productive when developing in Rails is that all the code that we don’t have to write because someone else in the community has already written a plug-in that provides the functionality we need. You can save yourself a ton of time and hassle by becoming good at searching the Web (and especially the almighty GitHub). A couple of places to find plug-ins are Core Rails, Railsify and Rails Plug-in Directory. Need to integrate with an existing API or consume some kind of standard format data? Need tagging, pagination, or another common Web application feature? Odds are that some great Rails or Ruby developer out there already has a project going that will get you at least most of the way there. For most people, the word “test” brings back scary memories of school exams. When working with Rails, however, automated testing can make your development experience much more enjoyable. While lots of people have strong, nearly religious, opinions about them, at their core, automated tests are just little helper programs you write that run bits of your main code to make sure they do the right thing. When done right, testing will improve your workflow and increase your confidence in the results. Projects often include more than just application-specific code. Sample data have to be created, Web services have to be queried, files have to be moved, code snippets rewritten, etc. Resist the urge to shell script or to cram in a migration or controller. Use Rake. It rocks! Rake is a build tool written in Ruby, very similar to make. Rails projects have several Rake tasks already defined; to see these, run the rake -T command. Exceptions happen, and when they do, you want to know about them! Your client shouldn’t be the one telling you that a problem has occurred; you should already be aware of the issue and working to resolve it. 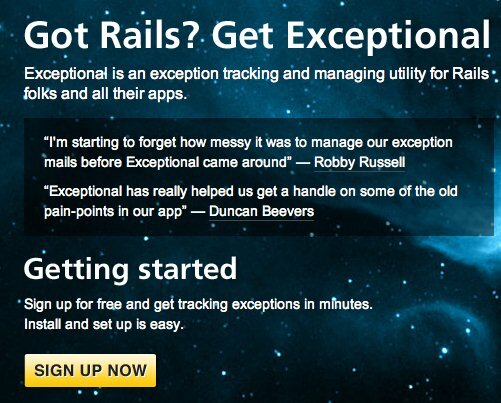 Exception notification has been available in Rails for a while. There are exception notification plug-ins that make it easy to be notified. However, some services such as Airbrake Bug Tracker and Get Exceptional add a lot of value to your application. Both of these services are easy to install and provide a great UI for tracking your exceptions. You can even sign up for a free account to try things out. By centralizing the application exceptions, you are able to see how frequently these exceptions occur, what environment they occur in (a particular browser? a particular location? ), what parameters were present and the full stack trace. This centralization of data helps you see patterns and resolve the issue more quickly, which results in a better application and happier users. As of version 2.3, Rails runs on top of Rack. Rack makes it possible to mix and match between Ruby Web frameworks and servers. If you’re using a framework that supports it (like Rails, Sinatra, Camping, etc), you can choose from any of the servers that do also (Mongrel, Thin, Phusion Passenger, etc. ), and vice versa. In addition to introducing all kinds of new options for deployment, this change means that Rails now has access to the exciting world of Rack middleware. Because Rack lives at the intersection of your app and your server, it can provide all kinds of common functionality directly. A great example of this is Rack::Cache. And make sure your controller actions send the right headers (for example, by setting request.headers[“Cache-Control”]) and Bam!, you’ve got caching. You’ll often need to get data from production to dev or dev to your local or your local to another developer’s local. One plug-in we use over and over is Yaml_db. This nifty little plug-in enables you to dump or load data by issuing a Rake command. The data is persisted in a yaml file located in db/data.yml. This is very portable and easy to read if you need to examine the data. Many people have questions about when to put a constant in the site_config.rb instead of the class it is used in. For a constant that are only used in a single class, we suggest putting it in that class. However, if the constant is used in more than one location, put it in the site_config.rb. For more on constants, have a look at Rubylearning. Sometimes you may have code that you’re curious about. Will it work this way? What’s the output? What can I change? Rails ships with a wonderful tool called console. By running script/console you will enter an interactive environment where you can access your Rails code just as though the application were running. 9. Ugly Views Getting You Down? Try Haml. Haml is marketed as “markup Haiku.” Its CSS-inspired syntax lets you focus on the semantics of your data rather than worrying about closing all the angle brackets that come with using ERb and HTML. Rails and Ruby both have large and active communities that constantly generate changes, improvements and new projects. Trying to keep up with all the activity can be daunting, but it’s essential if you want to benefit from the community’s best work and continue to increase your Rails and Ruby knowledge. GitHub has a most-watched projects page, which is a great place to start. the GitHub blog’s Rebase series both feature selections of interesting work from the website. Another avenue is the Rails Core mailing list and the #rails-core IRC channel. This guest post was written by Greg Borenstein and Michael ‘MJFreshyFresh’ Jones, lead Ruby developers for StepChange Group. StepChange designs, develops and manages social media widgets and Facebook applications in partnership with leading brands and agencies. Outside of work, Greg builds drum-playing robots and other hardware hacks, and MJ leads a local group of Unicycle-borne pirates. They live and work in beautiful, moist Portland, Oregon.